I purchased this 61 Champ Pickup from the nephew of the original owner in Staunton Va. in the fall of 1999. When purchased it had been sitting for about 14 years waiting for the completion of a restoration started by the original owner. The truck started its life as a service vehicle for a Staunton Body Shop and was always in the family until I purchased it. Restoration wise, the frame had been completed and the body replaced on the frame but nothing else was done. The nephew had changed all of the fluids in the truck and installed new plugs, cap and rotor along with a new battery. When I first saw the truck, I couldn’t get my Jeep stopped fast enough to get out of it. My friend who had accompanied me on the drive was the same way. In fact, he was out of my Jeep before I was. We never even told the owner we had arrived and when he realized we were there we were under the truck checking things out. He gave us the keys and the truck immediately started. A quick test drive into Staunton revealed a minor problem that required a stop at a hardware store to obtain a screw to hold the gearshift lever in place on the column. After paying for the truck and installation of 4 new tires, we were on our way home. Yes, we were driving the truck. About 40 miles up the road, it started to blow steam out of the radiator so we stopped bought a new cap and at the same time zerk fittings for the rear axel, which we installed and then greased it. From that point on we drove it home with no further incidences and only the loss of one headlight. I would be remiss if I did not tell this was a harrowing trip up Interstate 81 and 78 late at night traveling at a maximum of 55 MPH. The large trucks just blew by us rattling this truck. 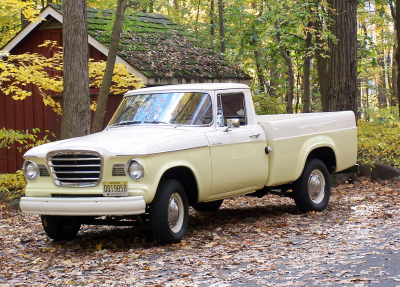 My truck is equipped with Studebaker’s 6 cyl 159 CI engine and has a 3-speed transmission with a column shift. In its day it was a low priced truck that included only one option a heater. It did not even have floor carpet or a right side armrest. I have almost completed the restoration of the truck and will finish it soon. But have a lot of fun driving it. It is painted in a two-tone paint scheme that Studebaker had authorized but never used in 1961. Its colors are true 1961 Studebaker colors of Suntone Yellow and White. It is painted to the exact specifications of the authorized two-tone scheme and to my knowledge is the only one in existence in a two-tone scheme. The truck shows 86,000 actual miles on the odometer. As for activities, I belong to the Studebaker Drivers Club, have served as President of the Keystone Region Chapter of the SDC (the largest SDC chapter with 400 members), Avanti Owners Association, International where I serve as a national Board member. I also belong to the Lehigh Valley Region of the AACA. If you wish articles on my other cars I will be more than happy to provide them for you. I currently own, in addition to the Champ Pickup, two Avantis and a 63 GT Hawk. Yes, they are all Studebakers. Please just feel free to give me a call at 610-428-3299 any time. See you in the future as I write about Studebaker’s past. Don Jones, Bethlehem Township Pa.